In the ever-changing technology driven world we live in, we are always trying to find better and more efficient ways to do things. With that in mind, why is it that when it comes to the building envelope of a structure, we continue to build them in virtually the same fashion that we have for more than a century? That’s not to say that traditional “stick framing” hasn’t deservedly had its place in the evolution of building. After all, it was better than using stones or bricks right? Now that we’re in the 21st century and heating and energy costs are higher than ever and the construction industry is steering towards more environmentally responsible products, it only makes sense to consider improving the building envelope process. That is where structural insulated panels come in. Why build with EnerSmart SIPs? EnerSmart structural insulated panels (SIPs) are a pre-fabricated, engineered, high performance wall, roof, and rim board building system for residential, commercial, and industrial construction. The panels consist of an insulating EPS (closed cell, heat aged, virgin bead) foam core glued between two structural oriented strand board (OSB) facings. There are no studs or framing members for structural purposes. SIPs share the same structural concept as an I-beam. 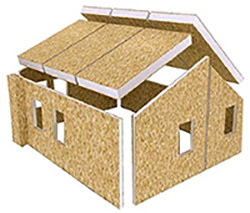 The rigid EPS core of the SIP acts as the web, while the OSB sheathing exhibits the same function as the flanges. Other facings can be used if required (plywood, pressure-treated plywood, cement board, magnesium oxide board, etc) but through extensive research, we have found OSB to be the most cost effective and versatile. EnerSmart manufactures an 8′ x 24′ (or smaller if desired) panel by using high quality certified materials and uses a closely monitored and quality controlled lamination process. The 8′ x 24′ size of EnerSmart’s panels is significant because a lot of other SIP manufacturers only produce 4′ x 12′ panels (or smaller). By pressing larger panels, it means the end user has fewer splines (and subsequent thermal bridges) and has fewer panels to install on site thus cutting down on installation time. EnerSmart has the ability to press any desired thickness of panel but the most common sizes range from 4.5″ – 12.25″ thick. EnerSmart SIPs are manufactured under factory controlled conditions and can be pre-fabricated to fit nearly any building design. All panels that leave the plant have been reviewed and stamped by a third party engineer. The result is a building system that is extremely strong, energy efficient, affordable, and healthier and quieter to live in. For more information on the certified products used in our panels, click here. SIPs are more energy efficient and air tight than traditional framing. SIPs provide a much higher whole-wall r-value than traditional framing. For example, if you have 2×6 walls filled with batt insulation (R-20), plus drywall and plywood, you probably consider your overall R-value to be R-21. But that only counts the insulated portion of the wall and ignores the weaker parts such as the structural framing (or studs) that provide thermal bridges and primary paths for heat to escape. Heat seeks the path of least resistance and flows through the weakest thermal component of the wall assembly. The key to SIPs is that there is no wall cavity because there are very few framing members. The EPS insulation is rigid and solid, unlike the porous nature of traditional fiberglass and open cell spray foam. SIPs are manufactured in a controlled environment with components without gaps or air pockets that create thermal bridges. 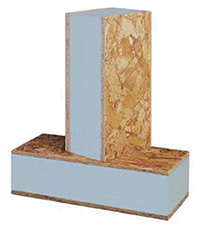 Studies show that a 2×6 framed wall (16” on centre) with R-19 insulation has a whole-wall R-value of less than R-14. This number could decrease even further if there is significant air leakage or increased framing factor. Conversely, a 6.5” SIP wall with the same window/door layout has a whole-wall R-value of R-22. SIP structures are drastically more air-tight than traditionally framed structures due to SIPs’ closed cell insulation, limited framing members, continuous OSB sheathing both sides, and sealed connections. Less air leakage means less heat loss (up to 40% of a home’s heat loss is due to air leakage). Blower Door Test studies show that SIP structures can be anywhere from 4 times – 15 times more air-tight than a traditionally framed structure. A SIP is a true air barrier and condensation cannot form in a SIP if installed properly. The simple reason is because a SIP uses closed cell insulation and has no atmosphere or air space for the condensation to form. Even when a SIP wall is subject to electrical and plumbing punctures, the integrity of the closed cell insulation remains intact. As a result, air and moisture cannot enter the system, reducing the potential for mold growth. SIPs are more environmentally responsible than traditional framing. The major components of SIPs, EPS and OSB, take less energy and raw materials to produce than other structural building systems. OSB is manufactured from fast growing, under utilized, and often less expensive wood species grown in carefully managed forests. The OSB production process uses small wood chips and highly automated machinery, making OSB a very efficient use of raw materials. The EPS is made from partially-recycled material. EPS leftovers from the manufacturing and pre-fabrication process are sent for recycling. It takes 24% less energy to produce EPS than fiberglass insulation of equivalent R-value. SIP structures use approximately 50% – 75% less framing members than a typical framed house. Less job site waste. Pre-fabricated and installation-ready EnerSmart SIPs allow installers to install the wall, roof, and rim board panels without the need to cut, frame, and trim extreme amounts of lumber and other materials. The installation-ready feature of our SIPs reduce the amount of jobsite material waste by 60% when compared to buildings constructed with regular dimensional lumber and framing materials. Less waste is obviously better for our environment. SIPs reduce energy consumption by approximately 50%. SIP structures reduce carbon dioxide emissions. SIPs provide exceptional indoor air quality and temperature control. When compared to buildings framed with dimensional lumber, EnerSmart’s large SIPs cover greater surfaces with far less gaps in the walls and roofs, to be filled and sealed, offering home and building owners better indoor air quality, reduced infiltration of outside pollutants, smaller HVAC system needs, and superior indoor temperature control. SIP structures stay cooler in the summer and warmer in the winter than buildings framed with dimensional lumber. A SIP structure allows for better control over indoor air quality because the airtight building envelope limits incoming air by controlled ventilation. Controlled ventilation filters out contaminants and allergens, and also allows for incoming air to be dehumidified, reducing the possibility for mold growth. SIP buildings produce less interior noise, fewer drafts, and more consistent interior temperatures. SIPs are stronger than traditional framing. With conventional framing, loads are distributed along 2×6 studs spaced at 16″ or even 24″ on centre. When you build with SIPs, the same loads are evenly distributed across the entire panel, making your home structurally superior to traditional stud framing. SIP walls can withstand axial loads from 2 – 5 times stronger than conventional 2x framed walls. SIPs are dimensionally stable. They are not prone to moisture that can undermine the integrity of wood framing. Wood frame structures shrink and bend resulting in potential increased air leakage and uneven finishing services. 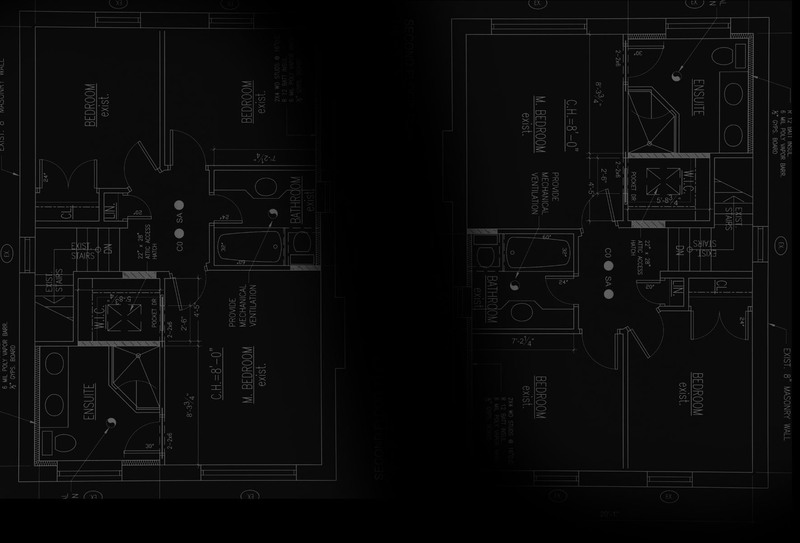 Prior to any production beginning, our drafting department converts the client’s blueprints into SIP shop drawings. These drawings, accompanied with the blueprints, are then sent to a third party engineer at which time he reviews them and stamps the SIP shop drawings. Upon the completion of the drafting/engineering stage, panels are laminated. Once the lamination process is complete, the panels are precision cut using a computer numerical control (CNC) machine with tolerances of +/- 1/16”. This is extremely precise considering that most stick framers will continue framing once something is within a 1/2”. During the CNC cutting process, the panels are cut to size, window & door rough openings are cut out, electrical box rough openings are cut, and beam pockets (if required) are cut out. The panels are then sent to the blocking station where the blocking crew completes the fabrication of the panels. During this stage, they will do things such as insert dimensional lumber blocking at the ends of panels and around rough openings, recess the foam around the panel edges to accept the connection splines and top/bottom plates, and drill chases into the foam to allow for the electrical wiring. Everything mentioned above is part of EnerSmart’s pre-fabrication process but if a customer simply wants “raw” panel, we are more than happy to provide that as well. The installation process is the fun part. Installing SIPs is often compared to building with lego blocks due to their speed and ease of installation. Once fabrication of the panels is complete, the panels are shipped to site (or stored at our manufacturing facility until needed). You can arrange to pick up the panels yourself or EnerSmart can organize the shipping through one of our reliable third party freight companies. Once the panels arrive at the build site, it is just a matter of following the labelled SIP shop drawings that are included with the shipment (corresponding panels are labelled as well) and the EnerSmart Installation Manual. As always, EnerSmart support is just a phone call away should you have any questions. We also have recommended SIP installers throughout western Canada if you decide to go the route of having someone else install them. In some cases, EnerSmart staff are also available for installing panels. Most wall packages are shipped with the intention of putting them up by hand and are typically not sent in longer sections than 12’ so a small crew can easily stand the panels. On a typical 2000 square foot bungalow, the SIP walls can be installed in 6 – 10 hours with a 3 – 4 man crew. If the customer has equipment on site such as zoom boom or similar for the purpose of installing panels, we can produce and ship larger sections of panel. Installing roof panels typically requires equipment such as a crane or zoom boom. By doing some simple preparation ahead of time, crane time and the associated cost can be significantly reduced. Copyright © 2014. Enersmart Building Systems Inc.